In the 2017 Atlantic 10 championship game, when a shot from reserve forward Emily Peters of Saint Joseph’s sailed over the stick of goalkeeper Emily Hazard and hit the back of the net, an era of Massachusetts field hockey came to an end. At that moment, the careers of UMass stalwarts like Hazard, Sarah Hawkshaw and Melanie Kreusch were over. In total, seven of the starters from the A-10 championship were playing their final game for the Minutewomen, the foundation of teams that had delivered two A-10 titles and two NCAA tournament appearances for UMass. On a team of such accomplishment, it is notable that two freshmen were on the field for the Minutewomen in the final minutes of the A-10 championship game. Those two, forward Lucy Cooper and defender Georgie McTear, scored the two goals in UMass’ furious comeback at the end of regulation. This season, returning only 13 players from that November day at Gladchuk Field, UMass is banking on those two players to rise to the occasion. With such a radical transformation of the team, the play of Cooper and McTear will likely determine the course of the next three years of UMass field hockey, and whether the Minutewomen can reclaim their longtime place atop the Atlantic 10. It was Cooper who first made waves with UMass. Coming from New Zealand, Cooper had never played in the U.S. before, and mid-August heat and a different style of field hockey caused her to struggle in the preseason. Nonetheless, coach Barb Weinberg put her in the starting lineup for the season opener against Holy Cross, and Cooper rewarded that faith with a flying start, recording four goals and three assists in her first four games. Although Cooper only scored two more goals after that opening stretch, she continued to rack up assists. She finished with 10 assists in 20 games in 2017, in part because she took over penalty corner inserts for UMass. Playing alongside Hawkshaw and Nicole Kuerzi, Cooper’s natural speed helped open up the UMass attack. Hawkshaw’s ball-handling set up Cooper in the attacking third, allowing the Minutewomen to move the ball quickly up the field and create scoring opportunities. Although Cooper speculated that she would have less of an impact on attack this year, she has already racked up five goals and 11 assists with two games left in the season. This year, however, she is making her presence felt more in the midfield and defensive backfield, rounding into form as a complete player rather than just a scoring threat. McTear, a native of Portsmouth, England, started all 21 games for the Minutewomen in 2017, including both games in the A-10 tournament. As the season went on, she became more and more of an integral part of the UMass defense. In the final nine games, she came off the field for just four total minutes and played the entirety of two 94-minute double overtime matches. McTear also contributed on the attacking end in her freshman year, notching five goals of her own, including game-winners against Holy Cross, Vermont and Virginia Commonwealth. All five of those goals came off penalty corners, but her big contribution to the UMass attack came from her ability to move the ball down the field, which enabled the Minutewomen to quickly attack in transition. In the A-10 championship game, Cooper came in just before Saint Joseph’s scored its second goal. Facing a two-goal deficit, UMass responded with four penalty corners in a little over two minutes, and after Hawkshaw’s shot on the fourth penalty corner was deflected, Cooper was there to put the ball inside the left post. Just over a minute later, on another penalty corner in the 69th minute, Cooper passed the ball in to midfielder Mirra Stillman, who set the ball up for McTear to fire it past Hawk goalie Victoria Kammerinke and tie the game. Although the Minutewomen ultimately lost in double overtime, both Cooper and McTear said that the experience of playing in the A-10 championship game was special. Last year, reaching the A-10 championship game was little surprise to most observers. Winners of back-to-back A-10 titles in 2015 and 2016, UMass entered the 2017 season ranked No. 22 in the country. Going into the 2018 season, UMass was something of an unknown. Although the Minutewomen returned just over half their roster from 2017, they also added transfers Antonet Louw and Clodagh Moloney, as well as several impactful freshmen. In the A-10 preseason poll, UMass was ranked second, behind St. Joe’s. Cooper and McTear were both named to the preseason all-conference team, along with junior midfielder Sophie de Jonge. 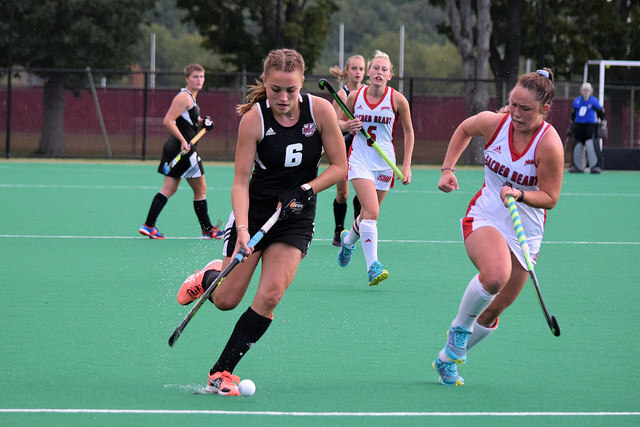 Louw has stepped into Hawkshaw’s role as a goal-scorer, with 20 goals in the season and five in a single game against Northeastern. But the departure of that storied senior class, combined with a relatively small number of upperclassmen, has changed the atmosphere around the Minutewomen. Be that as it may, Weinberg made clear that the talent of Cooper and McTear gives them an added level of responsibility. Without Hawkshaw, Kreusch, and the other seniors anchoring the Minutewomen, much of the burden has fallen on Cooper and McTear, who have embraced the role. With seven new starters and a brutal non-conference schedule, the Minutewomen have had their struggles this year. Ugly back-to-back losses at home to No. 1 Connecticut and Dartmouth sent UMass below .500 in the season’s second weekend, and the Minutewomen have alternated wins and losses ever since. Despite an 8-9 record with two games left in the season, UMass has all but locked in the third seed for the A-10 tournament, which begins November 2 in Philadelphia. Although UMass has taken care of business against weaker A-10 opponents, winning five of its seven conference games, the two losses came against A-10 leaders St. Joe’s and VCU. Facing No. 16 St. Joe’s in late September, the Minutewomen surrendered three goals in the first half en route to a 5-0 loss. Since Nov. 4, 2017, the A-10 has belonged to St. Joe’s. Boasting a stacked roster, the Hawks have been ranked all year, gone undefeated in the A-10, and have homefield advantage in the A-10 tournament to defend their title. It is safe to say that at this point, St. Joe’s is heavily favored to repeat as A-10 champions and return to the NCAA tournament. For UMass, 2018 looked to be a retooling year. The Minutewomen have positioned themselves to make the tournament and possibly shock the Atlantic 10, but it was never about this year. The next two years are when UMass will expect to go toe-to-toe with St. Joe’s and the other A-10 heavyweights again. If that happens, it will be because Cooper and McTear led the way.